Host Rachel Arner and Kaleb discuss college, depression, faith and motivation. Host Luke Ferrugia explores Kaleb’s personal life events and story, as well as the relationship between Humans of Adventism and the corporate Seventh-day Adventist Church. Dylan Marron, host of the podcast Conversations with People Who Hate Me, gave Kaleb a call for this bonus episode. A long-time fan of the show, Kaleb took the time to ask Dylan some advice on LGBTQIA+ social issues and religion. Conversations with People Who Hate Me is a secular podcast focused on taking negative online communication offline for deeper discussion. In this episode of the Disruptive Adventism podcast, host Jose Briones continues his series on youth culture in an interview with Kaleb, the HoA editor. Javier Diaz spoke at length with Kaleb about revitalizing the Adventist church experience. Topics covered here include advise to church leadership, advice to younger members struggling with whether or not to participate in organized religion, and an exploration of what it means to be a Seventh-day Adventist. The Carolina Conference’s Project Refresh sits down to talk with Kaleb about the Sabbath in a tiny chair. Kaleb shares a personal story about Sabbath in his professional context, as well as his desire to reframe how we think about Sabbath observance. The North American Division of Seventh-day Adventists decided to split their keynote address between four young Adventists applying their faith to the digital world: Humans of Adventism, That Christian Vlogger, gorgeous2god, and 71.5 Magazine. 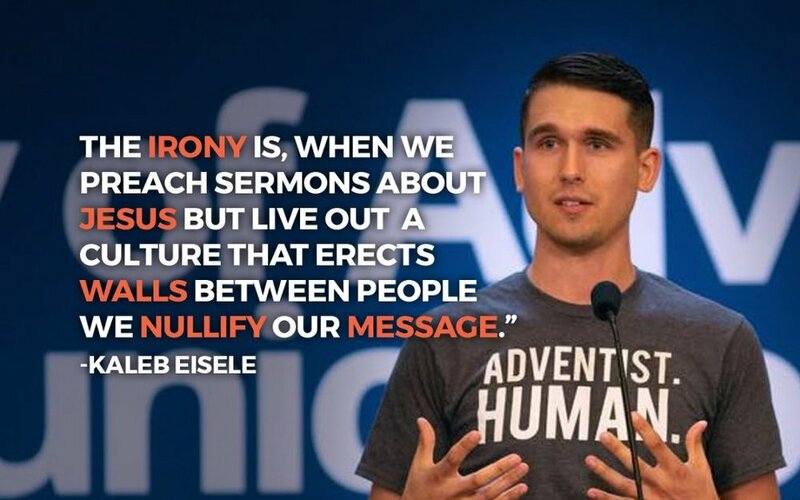 Hosts Josh & Jesse explore Humans of Adventism’s role in Kaleb’s personal life. Kaleb talks about growing up Adventist, leaving the church, and ultimately returning with a mission. The Times and Democrat, the leading newspaper in Kaleb’s hometown of Orangeburg, SC, put Humans of Adventism on the front page! Check out what they had to say about Adventists in the local community. A brief discussion of the power of storytelling, and its importance to online evangelism. Kaleb speaks with host Felicia Datus on how to build relationships online. Pastor Ryan Becker spoke with Kaleb Eisele for over an hour on his podcast. Together they explored the power of stories: how to listen better and how stories impact us as human beings. The College of Charleston followed up with Editor Kaleb Eisele just over a year after his graduation. Editor Kaleb Eisele spoke with Spectrum Magazine on the mechanics, motivation, and history behind Humans of Adventism. The most comprehensive coverage of Humans of Adventism to date, Spectrum Magazine takes a deep dive into Kaleb’s personal journey developing the platform from mid 2017 through the end of 2018. Natalia Perez discusses the growth, obstacles, and backlash HoA has experienced, as well as many of the overarching goals Kaleb and the team want for it in the future.